To view or update the image format settings for resized or modified images go to the Options step, select the Images tab and click the Resized image format.. button. It opens the Image format settings window. All images that must be modified in any way for your gallery (resized, rotated, with text or logo) are saved in the JPEG format. If image is not modified then it's just copied into the gallery folder in its original format. 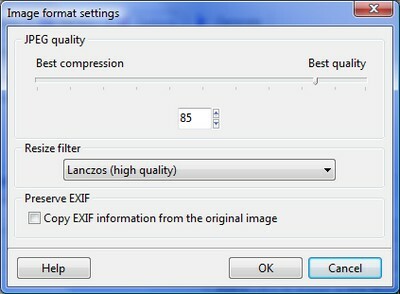 You can change the JPEG quality to make your modified image files less in size with low quality of the image, or bigger size but with higher image quality. It is recommended to keep this value in 75-95 range. The Resize filter determines the way images are resized. The speed of resizing and the quality of the resized image depend greatly on the filter you choose.